This picture shows how a bulging disc looks vs a herniated disc. neck known as cervical spine in scientific terms. The terms bulging disc and herniated disc are often confused. A bulging disc occurs when the disc shifts from its normal position backwards while a herniated disc is caused when a tear occurs and the inner disc material actually squeezes out. Often times a bulging disc will not be painful and the back pain will often begin after the disc becomes ruptured or herniated where it can then pinch on a nerve root. There are definite exceptions to this. 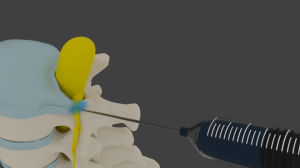 Spinal discs are the soft shock absorbers that are located between the spinal bony vertebrae and are responsible for allowing movement in the different spinal levels. They are normally very good at absorbing stresses during walking and physical activity. A herniated disc is when the inner disc material squeezes out due to a disc tear. lose air and becomes flattened somewhat. What Is The Cause of a Bulging Disc? There are various factors that contribute to bulging discs and one of the major causes is age. These shock absorbing discs tend to lose water content with age and as a result they become stiff, flat and more susceptible to damage. The disc loses its natural elastic coil with desiccation and minor trauma is enough to pressure the disc out of its natural placement. Carrying heavy loads could also cause bulging discs along with repeated trauma. This could be as a result of poor posture. Other factors that have a role to play when it comes to bulging discs include poor strength in the lower limbs, poor stability, abdominal fat and your occupation or everyday activities. In some cases, family history also has a role to play. The symptoms vary amongst patients. The location of the pain matters and this usually depends on the disc that has been weakened. Sometimes if the disc has bulged substantially a person will feel some nerve pressure on the nerve roots. When you have a bulging disc on the neck, some of the symptoms you may experience are pain, numbness and tingling on the shoulders, arms, hands, fingers and chest. A bulging disc in the thoracic area will consist of pain and the area of pain is greater and could be anywhere between the chest and upper thighs. If you have bulging discs on the lumbar spine, the pain can be felt on your lower back along with the feet, buttocks and legs. The symptoms are more evident when you are active since the bulging disc pressures the nerves. Sometimes the pain can be incapacitating. Granted, you may have no pain at all. Only if the bulging disc pushes on a nerve root will the pain travel along the extremity. Studies done over a decade ago showed that well over half the time, a bulging disc causes no pain whatsoever. Treatment of a bulging disc depends on various factors and these include the severity of pain, the duration of your symptoms and location of the bulging disc. Treatment starts out mild and depending on the extent of the bulging disc, aggressive treatment can be introduced. Common treatments for acute pain from bulging discs includes short term bed rest, heat application, ice pack application, exercise, anti-inflammatory drugs and short term spinal bracing. Restriction from heavy workload is encouraged. 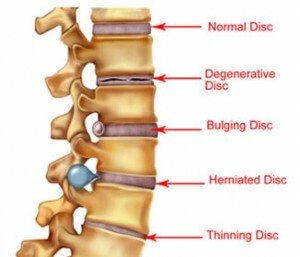 There are also alternative forms of treatment for bulging discs and these include: acupuncture, spinal decompression therapy and chiropractic treatment. Treatment is given in various phases; the first phase consists of pain management and protection from inflammation. In the second stage, the treatment seeks to restore join alignment, motion, strength and endurance. The third stage is all about restoring your back function and rehabilitation is tailored specifically for your age, goals and basically to suit your needs. The last stage of treatment is mainly preventative. You Arizona workers compensation doctor will assess your spinal structure so as to correct defects that may cause the recurrence of bulging disc. For those individuals who are experiencing very painful disc bulges and need additional treatment, a Phoenix workers comp pain management doctor may perform interventional procedures. This may include intradiscal injections or epidural steroid injections if the bulge is pushing on a nearby nerve root or causing a chemical inflammation.